If you picked up a controller last generation, odds are you've played or at least heard of some of Patrick Plourde's games. 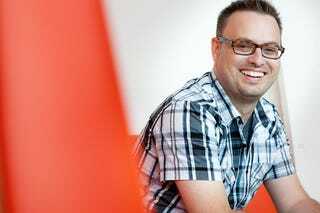 Having worked on many of Ubisoft's greatest hits as a creative director, Patrick is a pretty busy guy. I recently had a chance to chat with Patrick about his most recent work, Child of Light as well as what's next for him. I could only manage seven questions, but I did my best to make them count. The conversation starts below. First off, let me say thank you for taking the time to chat with me. Child of Light is a fantastic game that we loved, and an achievement you should be really proud of. You have an impressive list of credits to your name, from ZombiU, to Far Cry 3 to the Assassin's Creed series. Child of Light is arguably your most unique work to date, how did the idea for it come about? I've always been a fan of Japanese-style RPGs, so for me it was a unique chance to make one. The original idea was to do a Final Fantasy-style game, but using the concept art of Yoshitaka Amano straight in the game. From that starting point the game evolved to become Child of Light. How long did it take to develop Child of Light? Were there any moments that changed the direction of the game? The game's first team member joined in November 2012, so overall it took a little bit more than a year to develop. The game's scope and vision is incredibly close from the initial concept. The biggest change took place at the start of 2013 where we added the co-op feature to the combat. When you began working on Child of Light, did you think it would receive all the attention it has? When you make a game, you never really know how it's going to be received. That's why the weeks leading to the release of a game are nerve-wrenching. We worked hard to make the game stand out from the crowd and to make something truly unique. Its been a great honour to see all the positive feedback from the players! Was there a particular platform that was harder or easier than the others to develop for? Was there a lead platform for Child of Light's development in the beginning? We basically played the game on PC for most of the production. Other than making sure we would stay at 60 fps on the old-gen consoles, there wasn't any particular issues with any console. I wished we had more time to implement all the different controller options on the Wii U however. That platform really supports so many configurations its easy to lose track when you need to ship six platforms at the same time. Were there any features or aspects you would have liked to add, or did add and had to cut? And if so, why? I would have liked to support multiple endings. We had one integrated in storyboards, but it really didn't work and we had no time to change it, so it was cut. What's next for you at this point, are you already on your next project? If so, can you share what it is? I'm about to leave for a nice family vacation. I'll see what are the possibilities when I come back. And finally, would you like to see a sequel to Child of Light? There are a lot of things I wish I could explore with this world. So maybe one day I'll be able to return to it! Please enjoy your well-earned vacation! It was a pleasure to have the opportunity to chat with you, thank you so much for your time, Patrick! For more information about Child of Light, check out both the Kotaku and TAY reviews here and here.